and our coven’s Outer Court are always OPEN for new members. Currently, the Coven itself is now CLOSED to new members. You must first meet with Lord Alexian for a lunch “screening” to discuss Wicca in general and also ask any questions that you may have concerning Alexandrian Wicca. This helps filter out people who really aren’t interested in our tradition. After “passing” this initial screening, you will be added to our private Facebook Group, and then immediately invited to attend a Sabbat with Twisted Oak as a Guest. Please make sure that you choose a food and post what you are bringing on our Facebook Group, under that specific event. Everyone is required to bring and share something for the potluck feast after every Sabbat. If you were supposed to receive an invitation and didn’t, please contact Lord Alexian. After attending a minimum of 2 Sabbats with Twisted Oak, you will become “Outer Court” eligible. Now that you are “Outer Court” eligible, you will be invited to join our Outer Court. If you choose to not join, you can not visit again, without first asking for another invitation, and then explaining why you turned down Outer Court. If you say Yes, and accept membership into our Outer Court, you will remain a member of our Facebook Group and continue to receive invitations to all our Sabbats and Social Events. There are also a few “open” classes where Outer Court members can attend. You will also be notified of these as well. 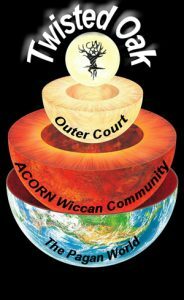 Basically, Outer Court is a status of “Affiliation” without making any attempt to “study” the craft and become a “Priest” or “Priestess”. It is required that you attend a minimum of 2 Sabbats a year to remain in the Outer Court. If you do not, you will be removed from the Facebook Group, and your “status” will be revoked. After you accept Outer Court and have attended at least 2 Social events, in addition to the 2 Sabbats, you may petition to join the coven to study *IF* we are accepting New Students. The “Hotseat” is just that. You are put in a chair and surrounded by the coven, and you are asked many many questions which you should answer truthfully from your heart. The TRUTH is the main thing to remember! After your hotseat, the coven will take a democratic vote to let you join or not. If you are turned down, you may still remain a member of our Outer Court and still celebrate with us! You may even re-apply to join at a later date. If you are voted “IN”, then you become known as a “Pre-Dedicant”. You will need to attend 3 pre-dedication classes and do 5 book reports. After this work is done, your “Dedication Ritual” will be scheduled and you will become an official “Covener” within Twisted Oak Coven, and be known as a “Postulant”. Once you are a “Postulant” you study for a MINIMUM of a “Year and a Day”, and a MAXIMUM of 2 Years, before you are Initiated and become a 1st Degree “Initiate” of the Alexandrian Tradition, and a Witch.